Lina Wertmüller’s harrowing 1976 film stars Giancarlo Giannini as a petty crook with seven unattractive sisters to support, and it features a picaresque, World War II-era journey through a prison asylum, army service, and a Nazi concentration camp. Wertmüller is more indulgent in highbrow sadomasochism than she is real profundity, but there’s no denying that the film is powerful in its story of subjugation and survival. A climactic scene in which Giannini saves his skin at the camp by seducing its disgusting female commandant is unnervingly honest. Giannini became a ’70s international icon partially on the basis of this work. 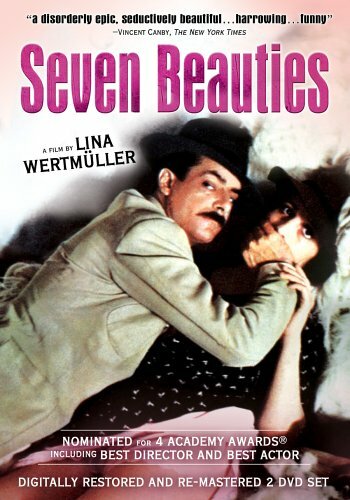 As many other Italian movies, I saw “The Seven Beauties” for a few times. One time is never enough. Every time I saw it, I would discover more and more things (words, scenes, faces, mimics, costumes) that I did not see before or I understood them differently. As a good wine, it gets better and better than more you taste it and the more mature it gets (or you get). This film is perfect. The combination of the script, filming, acting, scenes, ideas, and music make it perfect. But Giancarlo Giannini makes it memorable. This film is so perfectly constructed and well acted that it should be required viewing in any film school. The use of flashback allows the action to switch from extremely funny scenes set in Naples to extremely grim depictions of life in a concentration camp. Giannini is absolutely brilliant as he struggles to maintain his exagerated sense of dignity under increasingly difficult circumstances. The concentration camp is potrayed as hell on earth- all darkness and forboding. Contrast this with colorful Naples and the liveliness of the residents. The film develops these contrasts in a way that focuses on the power of human endurance and the survival instinct. Giannini has an incredible ability to communicate the full range of human emotions with his eyes alone. A truly astounding and very funny performance. Possibly the best I’ve ever seen.